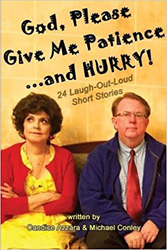 A laugh our loud memoir by Hollywood heavyweights! Publisher Avi Gvili of Boulevard Books announces that the hit comedy book “God, Please Give Me Patience…and Hurry!” written by TV sketch comedy writer Michael Conley and Brooklyn born actress Candice Azzara is part of a special Valentine’s Day tribute to her numerous leading men from Broadway, TV and feature films. She starred in two of “The Love Boat” movies with Oscar winner Ernest Borgnine who played her father while filming in Italy (“Seeking ‘Mr. Right’ in Rome” – Chapter 20 in the book). She also fell in love with TV sit-com star, Ken Berry, from “Mama’s Family” and “F Troop” fame while filming in Mexico (“Getting Sea Sick on a Romantic Cruise” – Chapter 12 in the book). Azzara is celebrating her 40th Anniversary in showbiz. The acclaimed Sicilian-American actress was born in Brooklyn, New York. She also began her accomplished TV career in New York, where she starred in the CBS sit-com, “Calucci’s Department” with fellow Italian James Coco. She also played memorable characters in her recurring roles in the hit Network sit-coms: “Soap,” “Rhoda” and “Caroline in the City.” Azzara played Lea Thompson’s nosy next-door Italian neighbor. “In fact, one of the funniest scenes was when I was on the phone with my ex-husband, while I was trying to teach Lea how to make Italian sauce,” Azzara smiles. Conley is a longtime variety/comedy sketch writer and a tribute award show writer who cut his teeth at the age of 22 (in 1982) when he began his writing career for TV legend Bob Hope. He is Jesuit educated, a tenured Hollywood publicist, and writer for the US Dept. of Veterans Affairs; he served as Vatican Press Advance for Pope John Paul II at His Papal Mass at the LA Coliseum.